TULSA, Oklahoma – Police are looking for answers after a woman is caught making meth inside the 81st and Lewis Walmart Thursday evening. Investigators say Alisha Halfmoon gathered the ingredients from throughout the store and started building a meth lab on a store shelf. Walmart security notified authorities around 6 p.m. after spotting the 45-year-old woman acting suspiciously. They told Tulsa Police that Halfmoon had been in the store for more than six hours. According to an arrest report, police observed Halfmoon on security tape mixing the chemicals. When Halfmoon was arrested, she had already mixed two containers of sulfuric acid. Police removed the lab from the store and a team from the Special Investigation Unit disposed of the chemicals. No one was injured. Halfmoon is now in jail, being held without bond. She was just bailed out of jail two days ago, after she was picked up on drug complaints Tuesday. 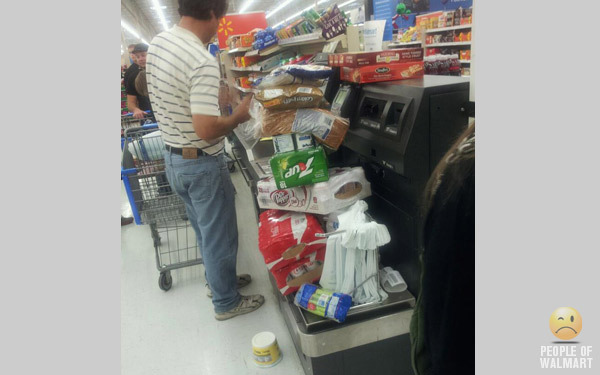 Police said they became suspicious when Halfmoon attempted to use the self checkout as a scale.. This entry was posted on December 11, 2011 at 6:02 am and is filed under Uncategorized. You can follow any responses to this entry through the RSS 2.0 feed. You can leave a response, or trackback from your own site.